Based on the acclaimed HBO documentary, the astonishing true story of how one American couple transported fifty Jewish children from Nazi-occupied Austria to America in 1939—the single largest group of unaccompanied refugee children allowed into the United States—for readers of In the Garden of Beasts and A Train in Winter. In early 1939, America’s rigid immigration laws made it virtually impossible for European Jews to seek safe haven in the United States. As deep-seated anti-Semitism and isolationism gripped much of the country, neither President Roosevelt nor Congress rallied to their aid. Yet one brave Jewish couple from Philadelphia refused to silently stand by. Risking their own safety, Gilbert Kraus, a successful lawyer, and his stylish wife, Eleanor, traveled to Nazi-controlled Vienna and Berlin to save fifty Jewish children. 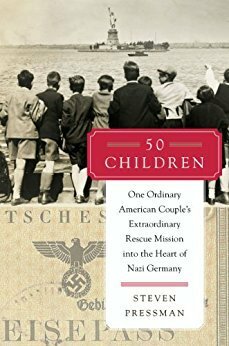 Steven Pressman brought the Kraus’s rescue mission to life in his acclaimed HBO documentary, 50 Children. In this book, he expands upon the story related in the hour-long film, offering additional historical detail and context to offer a rich, full portrait of this ordinary couple and their extraordinary actions. Drawing from Eleanor Kraus’s unpublished memoir, rare historical documents, and interviews with more than a dozen of the surviving children, and illustrated with period photographs, archival materials, and memorabilia, 50 Children is a remarkable tale of personal courage and triumphant heroism that offers a fresh, unique insight into a critical period of history. I got this book for my birthday and I finally got around to reading it. It is an amazing story which is kind of a given from the title. I really enjoyed learning about pre-World War II. I found the story of this American couple fascinating and this book taught me about the mass immigration out of Germany and Europe as World War II began. I also enjoyed learning a little bit about most of the children that were saved by the Kraus’s.